Some of the most helpful residents of our yard are too plentiful to name or even number: the bees who keep our raspberry patch humming. We rarely see honeybees. We sometimes see a tiny bee we have yet to identify. Most of our friends are bumblebees, but they are quite docile. Sometimes early in the morning we catch them sleeping on the leaves, which we find quite cute. This is the raspberry patch we share. We moved here four Februarys ago and brought a few dozen mature plants with us. Despite pruning and periodically giving plants away, we still have little to no space between bushes, and must carefully lift branches to move through and pick berries. This isn’t so bad, though, because we have to lift branches to check underneath for berries anyway; we just have to be careful of breakage as we walk between. As we do this, the bees ignore us or simply fly to one of the many other bushes. This is what happens to the berries right now: straight into the freezer. First they get spread out on a plate (or a baking sheet if there are a lot that day), so they freeze separately. If you dump them into a container without doing this, you will get one giant clump of berry. When the individual berries have frozen, they go into Ziploc gallon freezer bags. Sometime this winter they probably will become another batch of wine, but this fall we are doing hard apple cider first. Next summer I hope to begin beekeeping. In the meantime, we are happy to share our raspberries with our bee friends. It’s not the grand gesture but the little one, even the tiny one, that is telling. I was eating dinner the other night and my daughter came in and laid two slices of sharp cheddar cheese on my plate. It might seem odd, to bring me a snack while I was clearly eating a meal. But we have a rule in our house: There’s no such thing as too much cheese. Buying a single block of cheese is nearly pointless because it goes so quickly. And it is universally loved. 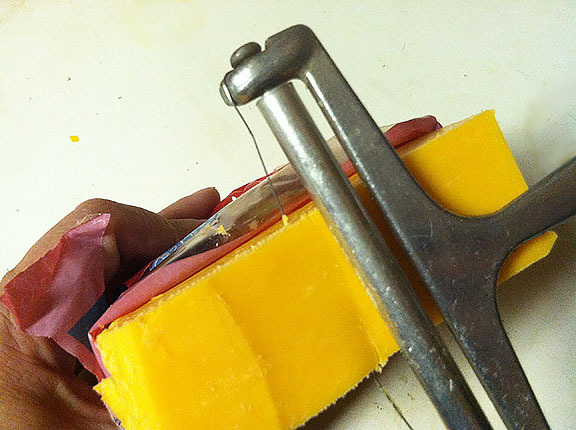 The joke now is for the slicer to ask, “Do you want some cheese?” and then laugh before the answer can come. There was no question this time; I didn’t even know she was slicing. She just walked in, laid the cheese on my plate, smiled and walked away. A tiny gesture, so precious. The donor Peep, before being decanted. Outside last night, my husband was showing me the zillions of raspberry shoots we have, wondering how to deal with them. Just then, the 22-year-old who moved in with us over winter stepped out. “This area is all raspberries,” I showed him, circling it with my hand in the air. His eyes lit up. “Raspberry vodka,” he said. By this time, of course, both vodka and berries were several days gone. It was the second of three infusions I’ve done in the last month. They’re stupid simple: pour vodka in a jar, add your flavorings and seal it tight. After about 24 hours, you’ve probably gotten all the good flavor you’re going to get. 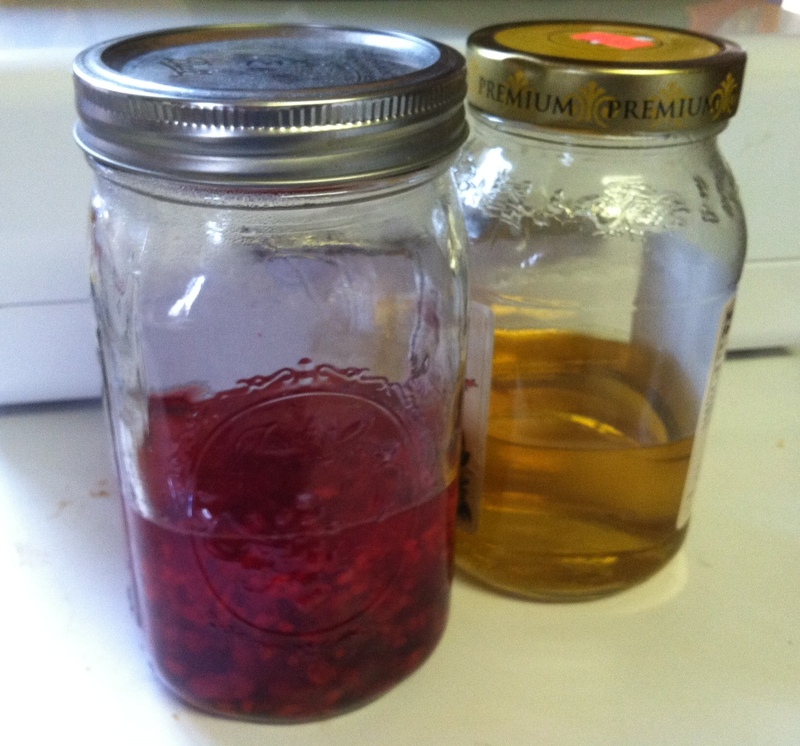 Vodka infusions: raspberry, left, and green tea. It was … all right. I poured mine into apple juice, which was a similar color, and the juice’s sweetness helped offset the tea’s slight bitterness. Unlikely to make that one again. Then … BERRIES. I have done this before, so I was confident of the result. The only difficulty I have found is in straining. The first strain is easy. After that, though, is a point where there clearly still is liquid to be had, but the faint pulp makes it hard to extract. Solution? Next time I am going to extract as much as I can, then take my drunken berries in slight liquid, add sugar and cook them down – carefully, it is alcohol + heat – and make a drunken raspberry syrup. This makes me want to acquire vanilla ice cream immediately. Here is my relationship with Peeps: I am head over heels in love with the Peep Surgery page. I like to eat Peeps about once a year, especially savoring the sugar crust. 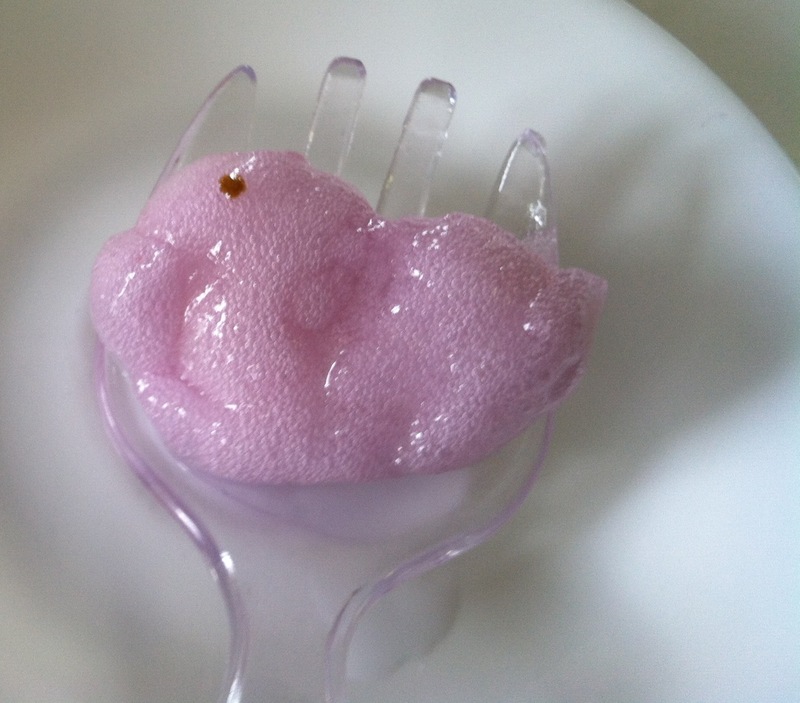 I knew from Peep Surgery’s detailed experiments that the Peep would not dissolve in vodka, but probably just offer its Peepy sugary outside, including the color. 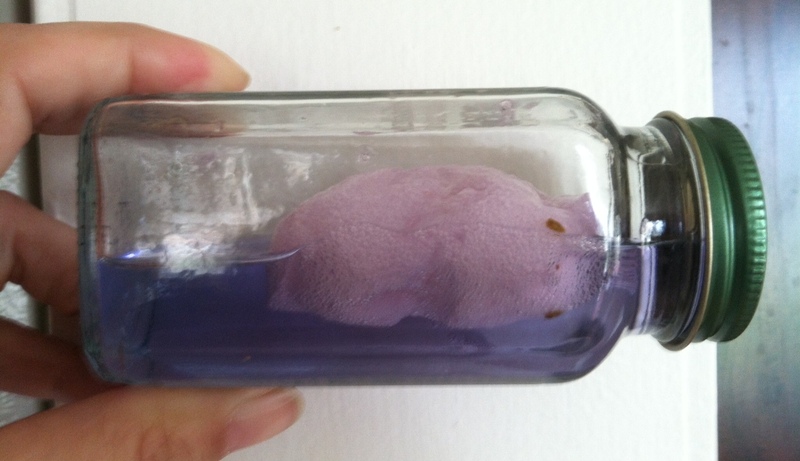 I chose a lovely purple, plunked a Peep into a spice jar and bathed it in Sobieski. It immediately began bobbing. Attempts to hold it still with toothpicks and drinking straws were only partly successful, but as I was not aiming high here, that was acceptable. When a couple of days had passed, I decanted the Peep. While its eyes remained intact, as expected, the rest of it was bloated and quite bubbly. While Peeps have bubbly personalities, like old men brandishing shotguns on porches, they are meant to have crusty exteriors. Ah, but the vodka? The true measure of the experiment? Predictable and yet somehow sad: It tastes like vodka with sugar dumped into it. The color, however, is quite lovely. 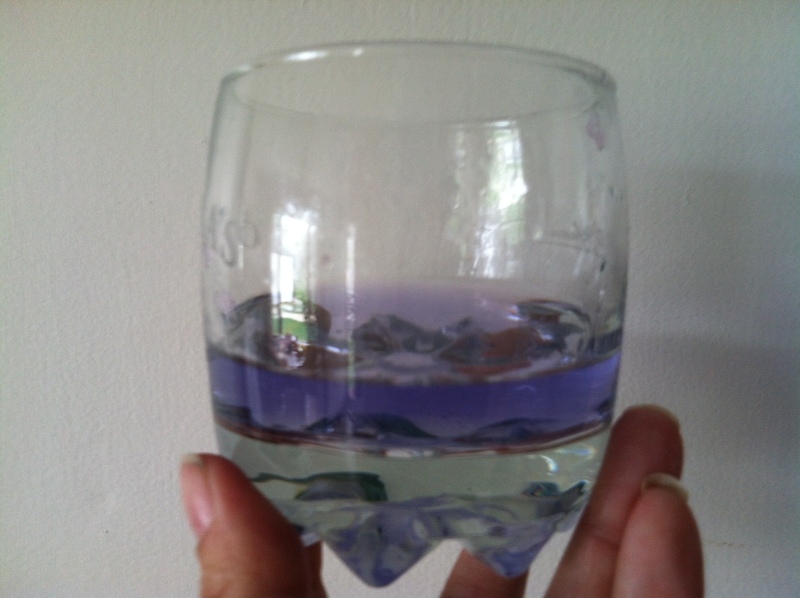 Purple Peep vodka: like too many things, more pretty than useful. Mask it with lemonade and wait for the next inspiration to strike. Suggestions always welcome. 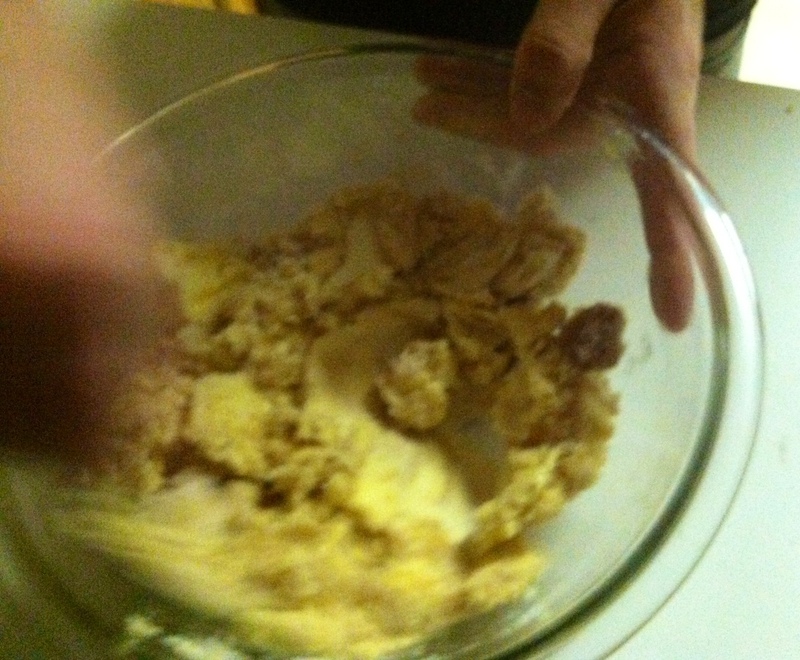 My son mixing cookie dough. I recently rattled off a number of tips for my son, who was baking some chocolate chip bar cookies, so I thought I’d share in case anyone reading this is new to baking. He was reading a recipe for a 10 x 15 jelly roll pan. I have never owned one of those, and I bet none of my friends has, either. Put the dough in a 9 x 13 pan, I told him, and add 5 minutes to the baking time. Does the dough jiggle when he starts to slide the pan or rack out? If it seems solid, give it a little pressure with a finger. Is there resistance? Or does it make him nervous? Go with your gut. If he took it out of the oven because it seemed done, give it a final test with a toothpick or a knife blade. Does it come out clean? Now that we’ve addressed doneness, let’s jump backward, because that’s what we did here at home. He was ready to jump into mixing, but all the ingredients weren’t out, and the oven was cold. Not the best approach, I said. Remember, baking is much more like chemistry than cooking is, and there’s less room for error. Get out the stick butter (actually margarine) and eggs, because you want both to be room temperature. To speed the butter-warming process, put the sticks on top of the oven. They will take advantage of both the ambient heat from the warming metal and whatever warm air vents from the oven. BUT if you’re not going to be paying close attention, put them on a saucer so you don’t end up with melted butter all over your stovetop. Your takeaway from this? Ingredients expire. Just like spices, just like makeup – sorry if these are shocking revelations – baking powder and baking soda both have expiration dates that should be honored, because freshness makes a difference in your end product. I told my son that I had made sure to buy new containers of both for Christmas baking. If yours are out of date, spend the less than $2 to get new ones so your baked goods rise properly. It’s a worthwhile investment. Did I miss a basic baking tip? Have a horror story to share? I love comments, don’t be shy. I go through lemon juice pretty quickly. Remember I promised to tell you about something else I drink every day? Ta-dah! Here it is! 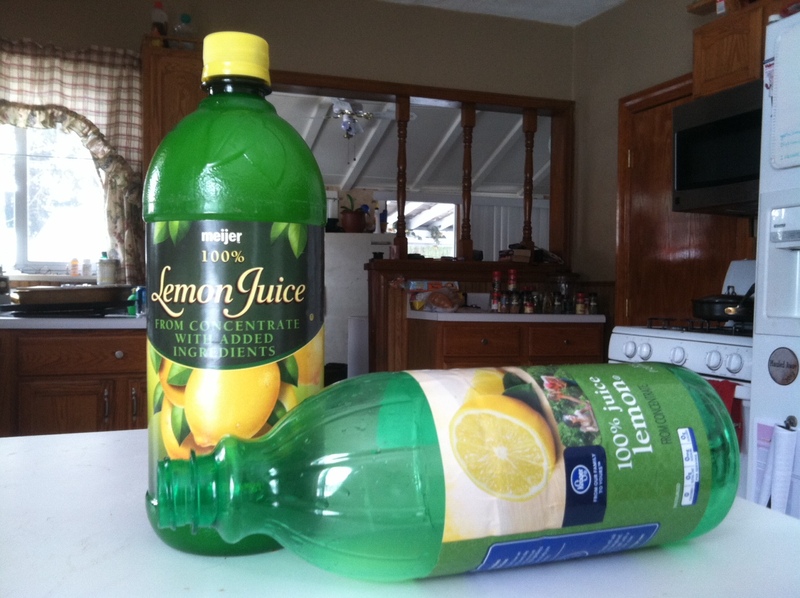 Perhaps you weren’t expecting lemon juice. Cool, I thought. My liver could use some help. I don’t abuse it with alcohol the way I did for a while, but I’m certainly not hopping on the wagon anytime … well, probably ever. I’m also inclined to try to do nice things for my liver because of something I can’t control, and that’s the need for a certain potentially liver-damaging drug that I’ve been told I’ll likely have to take the rest of my life. In a stubborn fit, I tried going off it for about six weeks last year. Bad, bad, bad move. Need the drug. Damn. So while every time I have my sugar tested (at least once a year) it comes up within normal range, I remain wary. I need to keep all of my sugar-processing organs humming along efficiently. Which brings us back to the lemon juice. It’s certainly not the only liver booster. Here’s a list of 14 of them, for example, including avocados and garlic, two more of my favorites. I do this because it’s simple and I can incorporate it into something I already do, which is drink a lot of fluid. If a splash of lemon juice makes my morning green tea that much healthier, why not take that step? An “ultra-premium antioxidant supplement,” this is called. I drink this stuff every day. Maybe you’ve heard of it, maybe you haven’t. 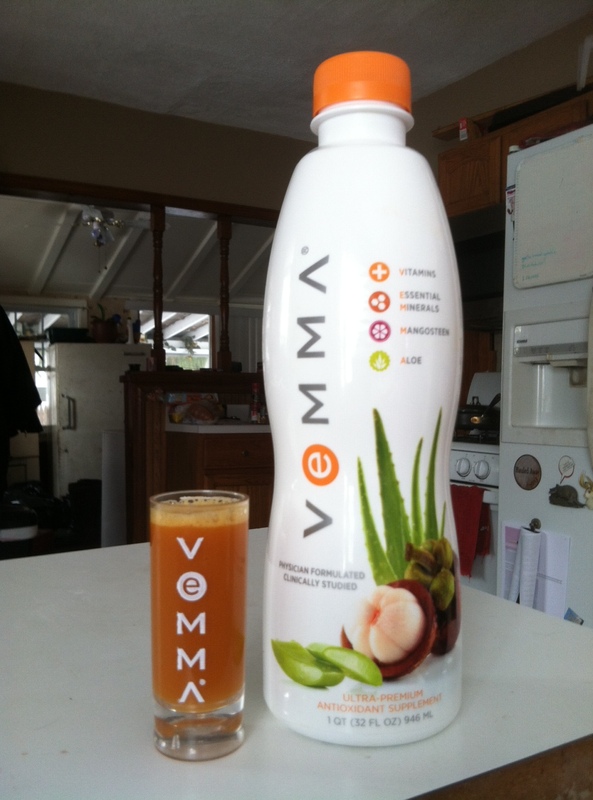 There’s a constant supply of VEMMA products in my home because my son markets for the company. The point is, it’s a liquid multivitamin. Here’s the nutritional info on this version, which includes 100 percent of recommended daily allowance of thiamin, riboflavin, niacin and biotin; 250 percent of vitamins B6, B12 and D3; and 500 percent of vitamin C. I drink that 2-ounce shot daily, sometimes alone, more often dumped into a half-drunk cup of green tea. Multivitamins every day. What are your choices? Tomorrow, I’ll tell you about something else I drink every day, and you probably have it in your kitchen. My venison chili, before adding spices and molasses. 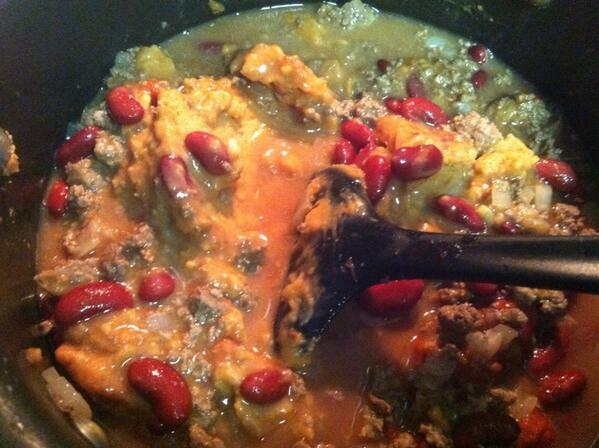 The lumpy stuff is refried beans. I like it very thick. This can be a very simple swap. For example, I was making chili last night, and one of the ingredients the recipe calls for is kidney beans, drained. I thought, why waste the liquid from the beans? Why not use that as part of the 2 cups of water that I need? That’s precisely what I did, infusing that much more flavor. No matter how novice a cook you are, you can do the same thing. For example, in our household, Minute Rice is a staple. Much as some of us love jasmine or basmati rice, my husband loves that bland fluffy stuff. That ease of use doesn’t mean it has to taste boring, though. Instead of water, use chicken stock to cook your rice. Don’t worry about making your own from the bones of some roast you crafted, just buy a box or can. If you feel really ambitious, throw in a bay leaf or two, maybe some orange rind, which comes in a jar in the spice section (trust me). If you’re not feeling that brave, go for some Mrs. Dash. Water is awesome for our bodies, but in cooking, think of it as a blank canvas. Your taste buds deserve more. 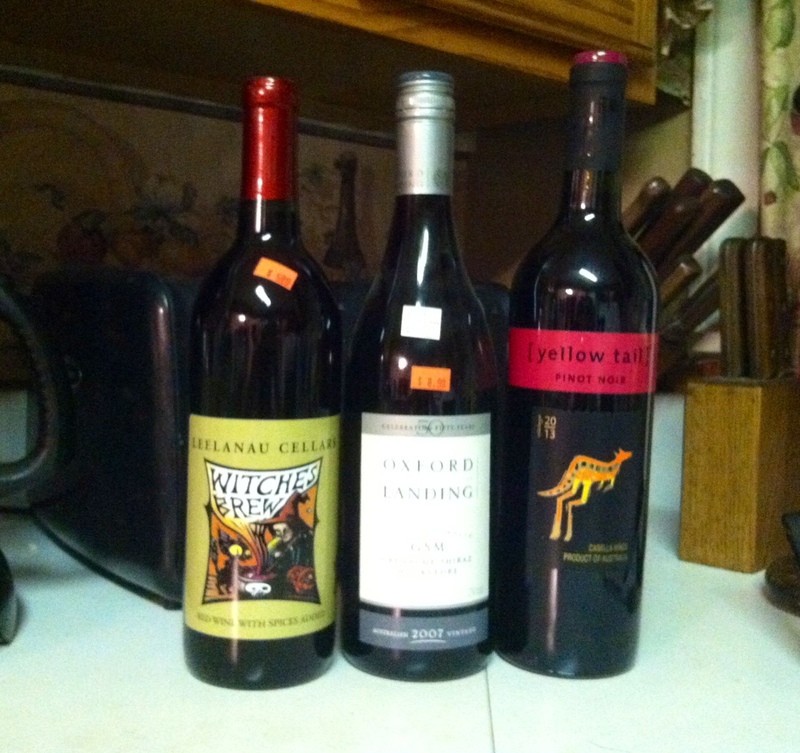 My three red wine choices: Leelanau Cellars’ spiced Witches Brew, Oxford Landing’s 2007 grenache shiraz mourvedre (GSM) and Yellow Tail’s pinot noir. Red wine is supposed to be good for you. Caving, I bought three bottles of red wine. OK, that’s the way abbreviated version. First I went poking around online to find out what kind of red wine I might be able to bear, because a lot of them I can’t. Cabernet Sauvignon, for example. I have learned to avoid anything described as “soft.” There’s a mouth feel I simply hate, and if you share my distaste then you’re probably picturing it right now. Pinot noir might work, I read. Beaujolais, especially Villages. And grenache, which I might find in Cotes du Rhone. I struck out on the Beujolais and Cotes du Rhone, although I’ve bumped into options since. I also saw a couple of labels at Ideal Party Store, a very good wine shop, that baffled me so I’ll be asking about them one day when the owner’s around. I found a lot of pinot noir. I found even more red blends. This was frustrating. Blends of what? Stuff I hate? Fruity stuff that probably shouldn’t be called wine? The excellent news is that I truly love the Witches Brew, which is a spiced red, so much so that I plan to go buy more. I suspect it is seasonal, so I may hoard. The others, sadly, both had the soft, tongue-coating aspect I so dislike. One I will sip one small glass at a time, because I was after health effects, after all. The other was tucked away for cooking, and my son already has expressed interest in trying it out. But right now? Right now I’m drinking Jim Beam Honey … because it’s what I like. Ready to greet me in the morning. This is part of my routine now. 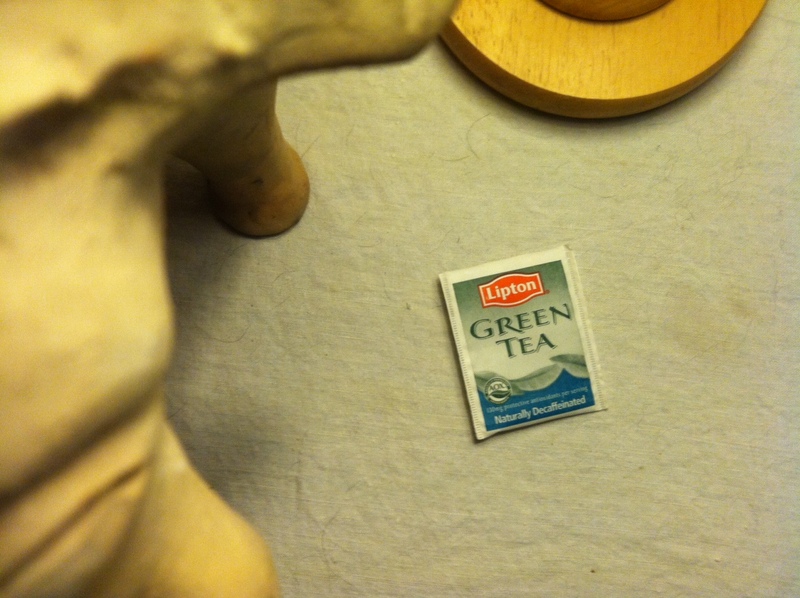 I get a bag of green tea out at night and put it near my glasses. That way it rolls nicely into my morning routine, because I prepare and drink something right away, rather than after three hours on the computer. I’m not a coffee person. This is not to say that I never drink it; on the contrary, I had developed the habit of drinking any coffee that was left in the pot, because I hate to let things go to waste. On the mornings my son made a second pot and left half of it behind, I would drink a cup, maybe two, and pour the rest into a juice bottle to save for later. If I only consumed one such “serving,” or even two, per oversized mug, well, I could just factor it into the rest of the day’s eating and move on. But my servings of creamer are more like a quarter-cup. So I have sworn off coffee. I haven’t entirely banished it from my diet, because that tends to piss me off and be counterproductive. But my day now starts with green tea, which is good for me, instead of a big mug of sugar. What about you? Coffee, tea or something else entirely? And why? I’m truly curious, so do chime in.